From creamy and comforting milk varieties to intense, euphoric darks, chocolate stirs up a range of emotions. 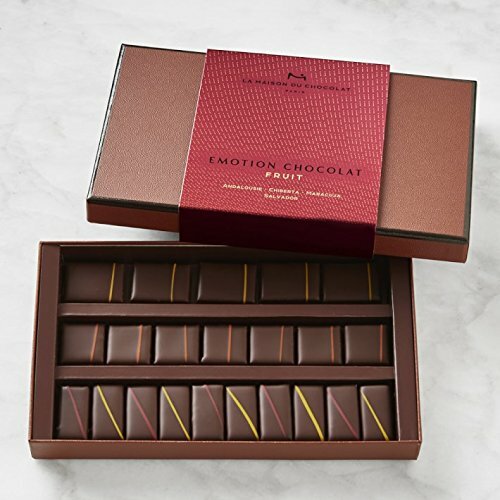 La Maison du Chocolat's collection of Emotion Fruit chocolates is nothing short of pure bliss. Andalousie: French lemon zest and cream with dark chocolate ganache. Maracuja: Passion fruit with dark chocolate ganache. Chiberta: Dark chocolate ganache infused with orange zest and blended with orange cream. Salvador: French raspberries with dark chocolate ganache. 21 pieces (5.12 oz. total). If you have any questions about this product by La Maison Emotion Fruit Box, contact us by completing and submitting the form below. If you are looking for a specif part number, please include it with your message.